I received an email stating my order from the Apple Store had been canceled. 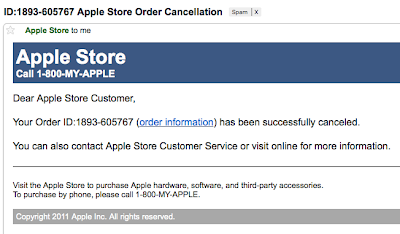 I hovered the mouse over the link the "Apple Store" helpfully provided and checked it out. It didn't take long to find that the IP address in the link was a system in Thailand. The rest of the URL looks out of sorts as well. Watch out for this kind of stuff. Clicking on the link could result in some malware being downloaded to your computer or lead to something else bad. Oh that's just a marketing ploy by Microsoft. Click on tge link and you end up downloading Windows 7. Rook To Front Yard - Check! How About The Eyebrow Empress? Was I Dropped On My Head?